See Los Angeles from the air during a 50-minute helicopter tour with your private party of up to four passengers. Cast your eyes over sweeping views of the Pacific Palisades, Marina del Rey, Beverly Hills, Hollywood and the Sunset Strip. Toast your aerial adventure with Champagne during a 15-minute landing atop a building that overlooks the downtown skyline. Take off from Burbank’s Atlantic terminal and choose from multiple departure times. 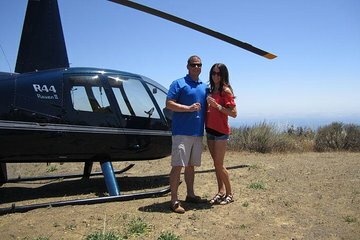 With this helicopter tour, see a ton of LA and touch down on a rooftop with champagne in-hand.